Borders, designed to be crossed and, whenever possible, abolished, were recurrent themes in Victor's oeuvre. 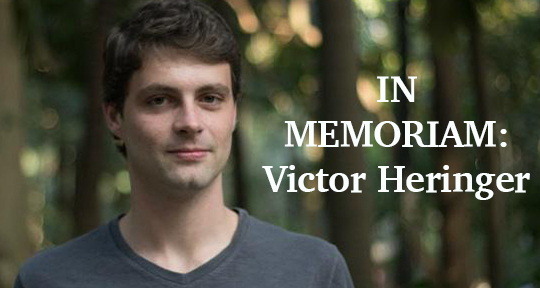 Today we bring you a reflection on the life of Brazilian writer Victor Heringer. Victor’s elegant and thought-provoking non-fiction piece “Notes for a General Theory of the Arriviste” was featured in the Summer 2017 issue of Asymptote where we have been long-time admirers of his work. Victor, who would be thirty this week, passed away on March 7, 2018. Today we celebrate his literary work. Victor Heringer was a multi-genre, multi-faceted artist. It’s not enough to remember him as “Victor, the poet” or “Victor, the writer.” Victor drew and made films and sound installations. He wrote poetry, nonfiction, novels. It was as though the borders between genres were not so fixed or important. Indeed, borders, designed to be crossed and, whenever possible, abolished, were recurrent themes in his oeuvre.